He has done General Management Programme from administrative Staff College of India, Hyderabad and Business Management Programme from Tata Management training Centre, Pune. He has served the corporate world for around 2 decades at very senior positions. In 1989 he won the parliamentary election (Lok Sabha) and was appointed as Minister in the Ministry of Finance, Government of India. He has the vision of innovation in education. 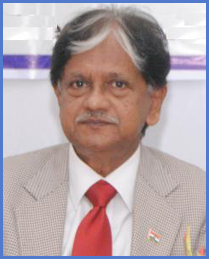 He is associated with various Educational and Social Institutions and their programmes. He is Chairman, Board of Governors, Lal Bahadur Shastri Institute of Management & Technology, Bareilly and also the Chairman, Board of Governors, Lal Bahadur Shastri Institute of Management, Delhi. He is General Secretary and treasurer of Lal Bahadur Shastri Sewa Niketan, Delhi and Holding trustee of Lal Bahadur Shastri National Memorial trust, Delhi. He is President of Hindustani Chetna Manch, Delhi. Shri Shastri is actively involved in political activities of Indian National Congress as Special Invitee, Congress Working Committee and Chairman, Hindi Department. Shri anil Shastri is widely traveled both in India and abroad.